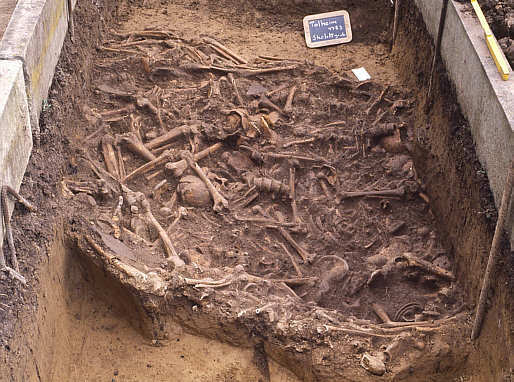 The Early Neolithic site of Talheim, located in modern day Germany, is famous for a pit containing the remains of 34 individuals who were massacred, presumably by a rival group. The victims have been classified as Neolithic farmers belonging to the Linearbandkeramik culture or LBK. The LBK maintained a sedentary lifestyle, and have been associated with long-house structures. The site has been dated to roughly 5000 BC. The villagers were killed by a variety of weapons including arrows, clubs and two distinct LBK axeheads called ‘Flachhacke’ and ‘Schuhleistenkeil’. In the aftermath of the attack, the bodies of the villagers were thrown into a pit along with some of their possessions which included LBK ceramics. Price, T. Douglas, Joachim Wahl, and R. Alexander Bentley. “Isotopic evidence for mobility and group organization among Neolithic farmers at Talheim, Germany, 5000 BC.” European Journal of Archaeology 9.2-3 (2006): 259-284.